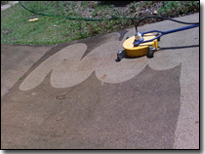 Blast Off Exteriors is proud to offer driveway cleaning to Smithfield, VA and the surrounding areas of (Carrollton, Chesapeake, Suffolk, Newport News, Hampton, Yorktown etc.) 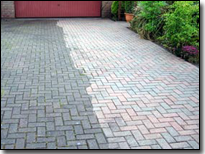 As you can see in our before and after pictures, our driveway cleaning services have a stunning effect and can bring your "Curb Appeal" to a new level! A lot of people do not realize how dirty their driveways, sidewalks, and patios are and are amazed with the difference, once cleaned. We can also remove irrigation rust stains from most of your concrete and brick surfaces.Brick also collects dirt, mold, and mildew and must be cleaned. 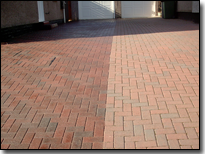 There are many types of brick; some brick can not withstand as much high pressure washing as others can. 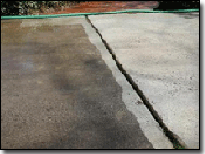 We can adjust the water pressure to meet these needs.Along with driveway cleaning, we also offer patio cleaning, walkway cleaning, pool decking & other concrete and brick cleaning services. We provide numerous home or business exterior cleaning and pressure washing services for decks, roofs, driveways, wood restoration and more. 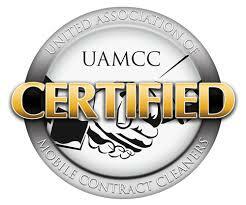 If you live in our Minnesota service area, click the following link to request a Free Power Washing Estimate!